It seems like every time we turn around, our fair city has won yet another accolade--distinctions that most assuredly contribute to Charleston’s status as a destination city. In yesterday’s paper, an article about the efforts to balance the needs of tourism and residents stated that tourism makes up 19% of the city’s economy and that “the number of visitors in Charleston over the past two decades increased about 70 percent” (Post & Courier, June 11, 2015). Well, that seems about right. So, exactly when did Charleston begin to attract visitors, and how did the city’s tourism industry come about? While it may be tempting to attribute the origination of the idea of Charleston as a historical tourist attraction to Mayor Riley in the 1970s and 80s, you’d be about half a century off. 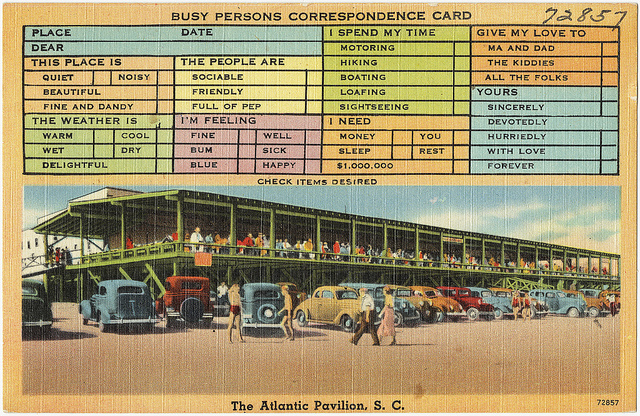 While the Atlantic Beach Pavilion on Sullivan's Island and the “Coney Island of the South” on Isle of Palms attracted visitors, Charleston itself was rarely a destination. 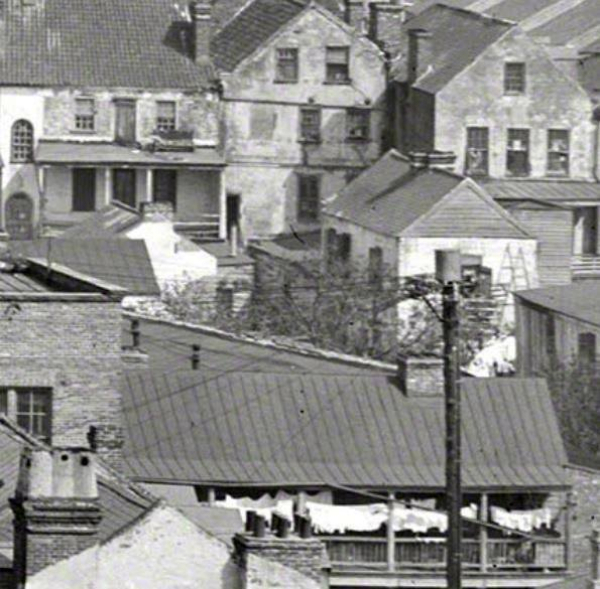 According to Stephanie R. Yuhl in Golden Haze of Memory: The Making of Historic Charleston (2006), Charleston’s reputation as a destination city for cultural and historical tourism is dependent upon the crucial period between 1920 and 1940 when local leaders instigated numerous measures to entice visitors to the city. Souvenir of Charleston SC: America’s Most Historic City. From the Margaretta Childs Archives at Historic Charleston Foundation via the Lowcountry Digital Library. Although Charleston was noted as being a worthy stop on tours of the South and recognized for its beauty and historic merit, this position was not successfully exploited to attract tourists until after World War I. The city’s cultural preservationists, artists, and writers celebrated the region’s historical architecture and artifacts as well at its physical beauty; local politicians and business leaders tended to emphasize modern amenities and recreational facilities. But, both groups recognized the importance of increasing tourism as their respective ventures were dependent upon ‘luring’ outside capital to the region. The results of Charleston’s artistic Renaissance attracted attention, and with Mayor Thomas Stoney’s election in 1923, the local government began to pursue tourism with coordinated enthusiasm. The post-war prosperity had been brief, the region’s future with large-scale farming and shipping was limited, and the Navy Yard had cut thousands of jobs: the local economy was in dire straits. 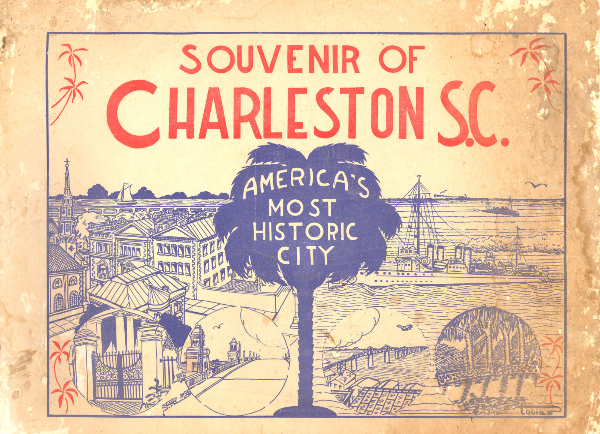 Mayor Stoney said, “There is every reason to believe that Charleston will soon develop into a great tourist resort; and it will be my great effort to promote this development in every way practicable.” In 1924, he declared Charleston “America’s Most Historic City” and pushed development of modern infrastructure to stimulate tourism. And thus, the horse was out of the gate. "Where Mellow Past and Present Meet"
In March, 1939, the premier travel magazine National Geographic published a lengthy article about Charleston including 44 color photographs--it’s really lovely; the SC Room at the Charleston County Public Library has a copy if you’d like to see it. Copies of the magazine were included in then Mayor Lockwood’s time capsule, to be opened in 2039; his goal was “to hand over to future generations a city that is ever new at the same time that it is ever old.” The article was penned by local writer DuBose Heyward, of Porgy (and Porgy and Bess) fame, who extolled Charleston’s charms for the magazine’s wide audience. It is a beautifully written (if not complete) portrayal of Charleston’s drama’d past and the tension of its “past meets present” approach to history-based tourism, which had become “an economic ‘back log’ against evil days”. The same month, House and Garden Magazine published a lengthy article entitled “Charles Town” and six months later one about the “Old South”. Readers became enamored of all things Charleston. 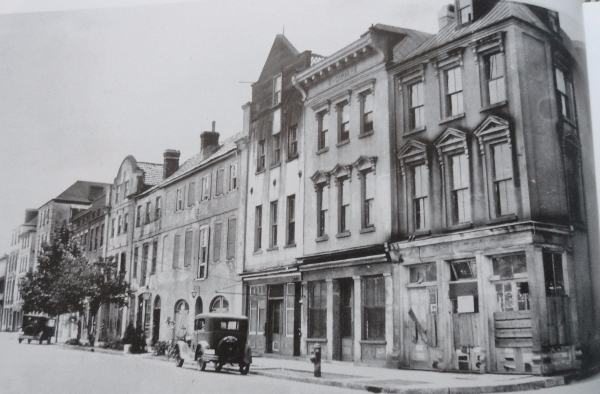 Early efforts in the promotion of Charleston included its unrivaled endeavors in the preservation of historic buildings; probably the most famous of which are the 13 dwellings on the west side of East Bay Street between Tradd and Elliot Streets, numbers 79-107. This row of renovated homes painted various pastel colors first gained widespread notoriety as ‘Rainbow Row’ in the National Geographic spread, but just a few years before being so vividly displayed the buildings were in utter ruin. DuBose Heyward and George Gershwin took photographs of the rear of the buildings to consult while building the stage for Porgy and Bess. Built as merchants’ homes between 1740 and 1886, this row of Georgian buildings originally stood on the waterfront and had stores on the ground floor and living quarters above. After the Civil War, the buildings fell into slum condition and were so unsanitary that a City Council member suggested that they be destroyed. Susan Pringle Frost, founder of the Preservation Society of Charleston, bought six of the buildings but lacked the funding to restore them immediately. In 1931, Dorothy Haskell Porcher Legge purchased numbers 99-101 and began restoring them. In a May 13, 1973 article in the News & Courier, Mrs. Legge stated, “When we moved here, it was the worst block in the city,” describing the slums as “not just a family in every house but a family in every room of every house.” She admitted that her friends thought she was crazy for moving her two young daughters into the area, but she said she was never worried for their safety since their tenement neighbors were friendly and kind. “However, the girls can really tell some stories about life in the tenements overlooking the courtyard.” No doubt! Mrs. Legge met a couple from New York who wintered in Charleston and invited them over to her home. They said they wished they had something similar. “If you’re serious, I can get the house next door for you.” They were and she did. Renovation of the rest of the homes in the block soon followed. Mrs. Legge said that since her house stood in the midst of ugliness that she would “make it a pretty color; and I had it painted this sort of peachy pink.” Her neighbors followed her lead, and “somebody came along and said it looked like a veritable rainbow and it’s been called Rainbow Row ever since,” she said, but “I really prefer just plain East Bay.” Ever so humble, Mrs. Legge was recognized for her groundbreaking restoration work on the house with an award from the Preservation Society of Charleston in 1992. Known as the Othniel Beale House, 99-101 East Bay is pretty in pink below. Have you driven down East Bay Street lately? Both Lois and Ginger can be seen pounding the pavement on this block these days. Lois is representing the buyer for 103 East Bay, the blue four-story house on the right above. This is the Joseph Dulles House, circa 1787, which was restored in 1930 by Anna Wells Rutledge (she also restored neighboring number 105, forty years later). 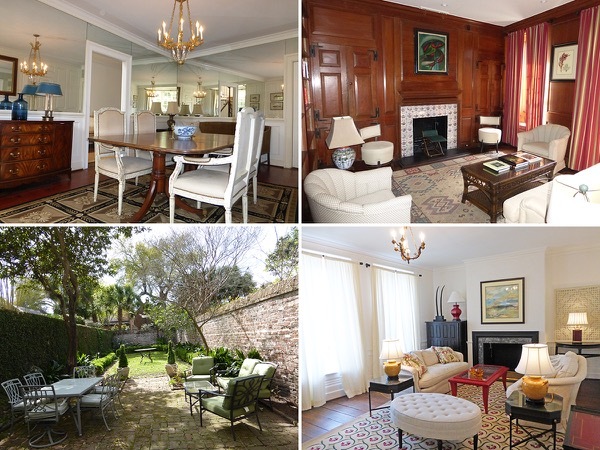 Ginger is listing the Charles Cotesworth Pinckney House at 95 East Bay, available for rent on August 15, 2015. The green, circa 1741 four story house with the Flemish gable roofline was owned by famous Revolutionary hero Charles Cotesworth Pinckney in 1779 and was restored by New York playwright John McGowan in 1938 (who subsequently restored numbers 93 and 91). The three-bedroom, fully furnished 3,018 square foot home has architectural features including original mantels with early delft tiles, heart pine floors and period woodwork. The walled courtyard and the views from the house are gorgeous. Please call Ginger at 843-513-5525 to schedule a showing!